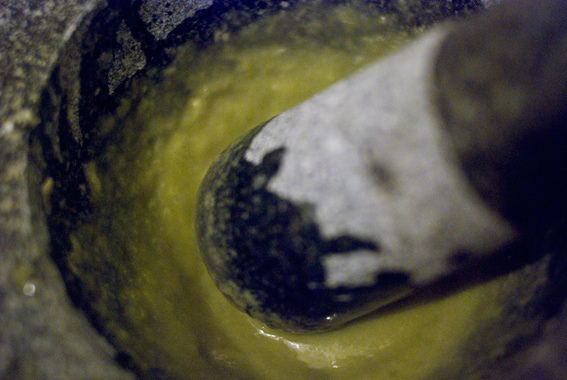 Allioli (Catalan spelling) is a garlic and olive oil emulsion, a bit like mayonnaise. The sauce itself comes from Cataluña, the Occitan Valleys of Italy, Provence, Pays d’Oc and Malta – it may have been around since the time that the Romans ruled the world. It’s called allioli, aioli, alhòli, ajjoli and even alah-oli – the name comes from the Latin, allium meaning garlic and oleum meaning oil. Allioli is a fantastic accompaniment to most fish, chicken, lamb, chips and if you like the taste of garlic as much as I do, it’s an exciting alternative to mayonnaise. Traditionally, allioli is made of garlic, olive oil, lemon juice and a pinch of salt. Add two or three pieces of garlic (remember this is raw garlic, so three cloves will be strong) to a mortar and a pinch of coarse sea salt. Grind the two together to make a paste (the salt really helps in the grinding process). Once you have a paste, slowly drizzle in extra virgin olive oil as you work the paste with the pestle – it really helps to have a little metal drizzler in the top of your olive oil bottle. 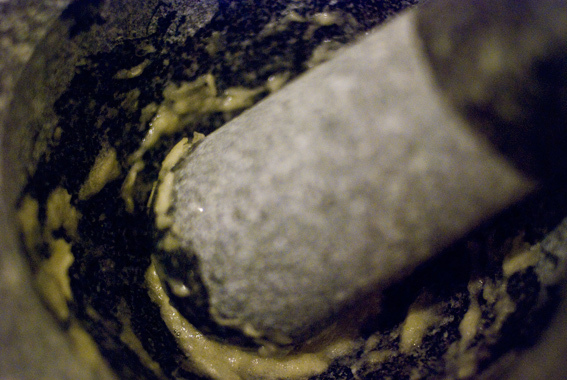 Keep turning the pestle and a natural emulsifier in the garlic will start to bind the oli. Be prepared to add a lot of oil, I’d say at least a cup full. As your emulsion starts to gain the thickness and consistency you want, you can add the juice of half to one lemon, to taste. When your allioli is done, it should be stiff enough to hold the mortar upside down without any dripping. Please note, real allioli is a greenish colour, like the olive oil it’s made with. Shop bought allioli is cream in colour, because of the processed junk that’s put into it. Real mayonnaise is also much deeper in colour, in comparison to commercial products. Traditionally, allioli does not contain eggs, however it is quite often made with the addition of egg yolks these days. If you wish to add egg yolks, use two before you start adding the olive oil, make sure you have a nice emulsion of egg, garlic and salt first. You will also find that allioli can be made in a food processor – the steps are the same, the important thing is to add the oil very slowly. I learnt a great tip from an Elizabeth David book (regarding making mayonnaise, but it works for allioli too) – if the egg yolks and olive oil fail to bind, set your mixture aside and clean your mortar and pestle (or food processor). Beat another two eggs and slowly add your original mixture, it should all bind together. You have the expense of another two eggs, but at least you don’t have to throw all your previous ingredients away. I notice that the tip is included in this article on perfect mayonnaise. 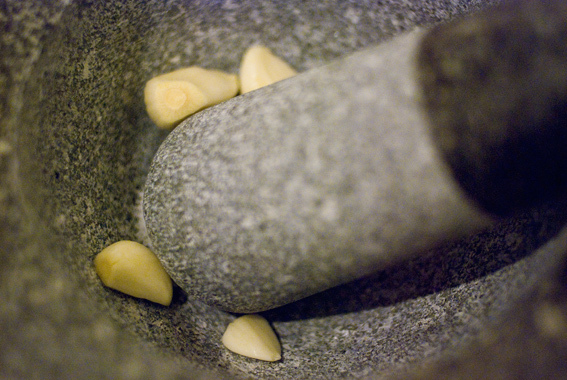 A word on the mortar and pestle, it’s invaluable for pulping the garlic, whereas a food processor will only chop it finely. 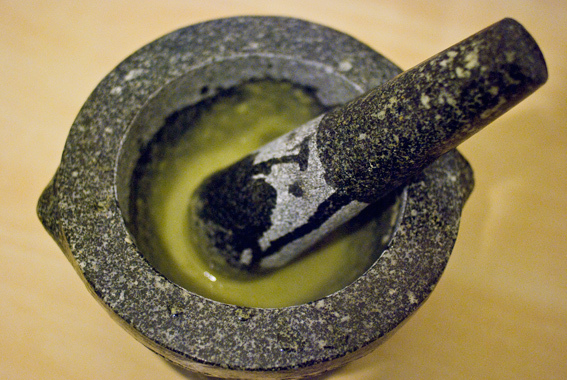 My mortar and pestle is a very large granite version from John Lewis and cost about £25. You may think, having seen these items on TV cookery programmes, big mortar and pestle, huge extravagance – well I can’t speak for Jamie Oliver, but the heavy granite pestle takes all the hard grinding work, out of the job at hand, because of its weight, all you have to do is keep it turning! This entry was posted in Recipes, Spanish and tagged aioli, allioli, Cataluña, eggs, Elizabeth David, garlic, lemon, mayonnaise, mortar & pestle, olive oil. Bookmark the permalink.